We would like to wish Belinda, Liam and Georgia all the best for the upcoming 2014 Australian Short Course Swimming Championships, in Adelaide, South Australia. The event is held from Wednesday 5th November through to Sunday 9th November. Good luck swimmers and have an ‘Awesome Meet’! If you would like to follow our swimmers progress you can head to the Swimming Australia website and select Live Results or select here. Please note Adelaide is 2.5 hours ahead of Perth. Heats are at 10:00am, finals are 6:30pm. The meet plan is attached below, so you can follow their events. Please note, the blue and green name annotation indicates potential swims based on heats. A swimmer must achieve the qualifying time (QT) in the heats to progress to the final. There will be no straight finals for multi-class (MC) events. 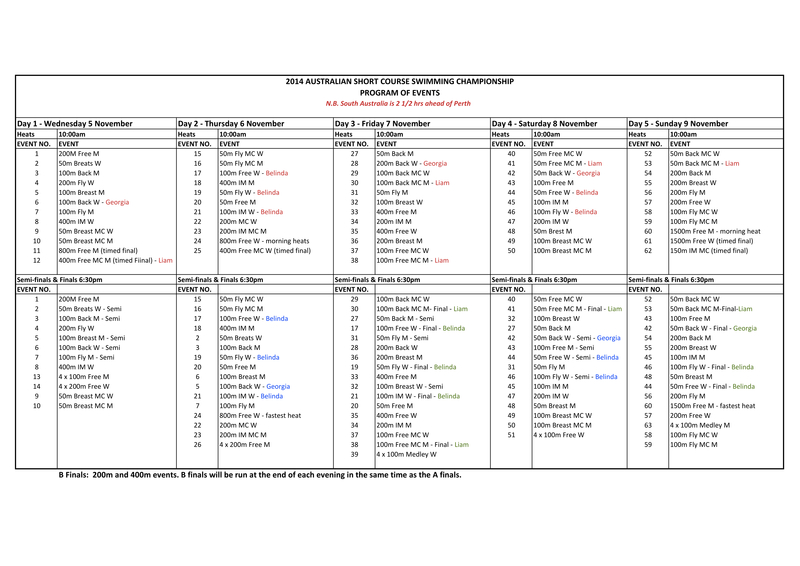 MC events with less than 10 competitors will swim heats and finals. Swimmers disqualified in heats will not progress through to finals.